History and Information on A. B. 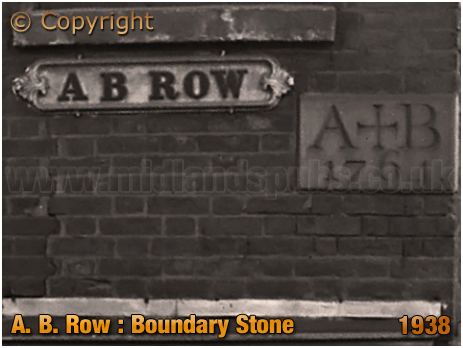 Row in Birmingham in the County of Warwickshire. A continuation of Coleshill Street, this short thoroughfare once formed the boundary between the borough of Aston Manor and Birmingham prior to the Greater Birmingham Act of 1911. Aston was recorded in the Domesday Survey where it appeared as Estone and was five times the size and rated at five times the value of Birmingham. Aston was a large Warwickshire parish covering some 10,000 acres and embraced the now-separate districts of Duddeston, Nechells, Castle Bromwich, Deritend and Bordesley. By 1550 the parish had become known as Aston-juxta-Birmingham. During the 19th century the borough of Birmingham took chunks away from Aston which remained outside the city's jurisdiction. During this period it was governed by the Aston Manor Local Board. However, it had become an Urban District by 1903 and was finally absorbed into Birmingham in 1911. Taken in February 1938, this image shows some of the properties that once stood on the south side of A. B. Row. In capturing this image that looks down Prince's Street, the photographer was stood on the corner of Duke Street on the opposite side of the road to the Turk's Head public house where Leonard Hodges was mine host. A date stone can be seen on the corner of A. B. Row and suggests the construction year of 1764. Some claim that the stone was moved to this building whilst other historians like Peter Walker was "satisfied that the stone was built into this new property in the year stated." 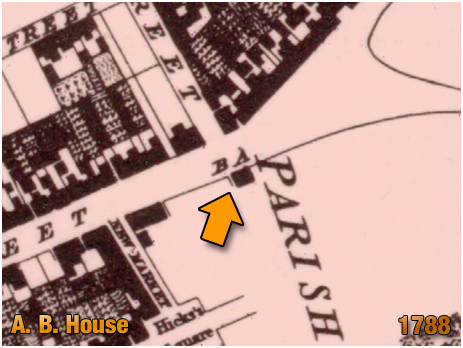 Moreover, he pointed out that the 1838 map by the Society for the Promotion of Useful Knowledge shows the "parish boundary line running a few inches into the corner of the building. The boundary between Aston and Birmingham once ran along Hockley Brook past Newtown Row, then south to Gosta Green and via Duke Street to A. B. Row." Looking on a later map produced in the late Victorian period, the building was certainly on the edge of the Parliamentary, Ward and Union boundaries. Whilst the boundary may be quite clear, the date of 1764 remains a bone of contention. When the Birmingham historian William Hutton tramped around the boundary in 1783 he wrote "we now cross the Lichfield road, down Duke Street, then the Coleshill Road at the A B house." This building is marked on Thomas Hanson's map of 1788. The letters are reversed on the map, possibly to indicate Birmingham to the left and Aston to the right. The isolated position and the size indicated by the map-maker suggests a large house. The building seen at the top of the page is a fairly large structure. Personally, I think that A. B. House is the old property of 1764 and that the other buildings in A. B. Row were constructed at a later date. Indeed, it is thought that prior to the development of the southern side of the triangle, the houses in Prospect Row had a singularly pleasant situation. Immediately in front of them were the Nova Scotia Gardens with the open valley of the Rea beyond. This pleasing prospect is believed to be the reason for the name of this stretch of road. By the way, a similar boundary stone was part of another A. B. House close to Deritend Bridge. Whatever the construction date, at the time of the first photograph, the building at No.1, on the corner of A. B. Row and Prince's Street, was occupied by the London Metal Warehouses Ltd., a company that had been trading from around 1929. The firm were stockists of non-ferrous metals, aluminium, brass and copper. They specialised in stainless steel and were distributors for Staybrite. There was a large advertisement for this trademark above the shop windows. 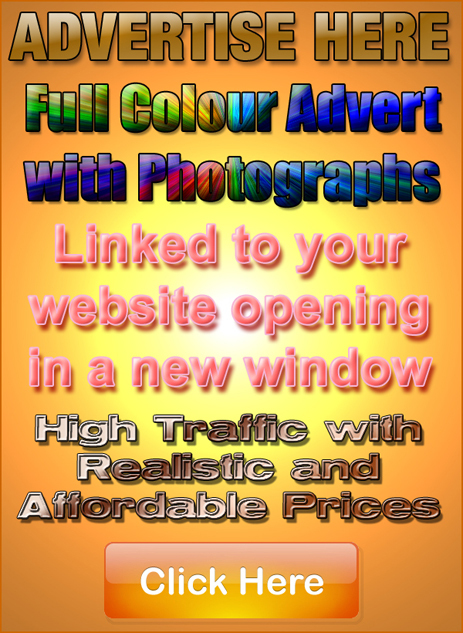 I have zoomed in to show this advert above. 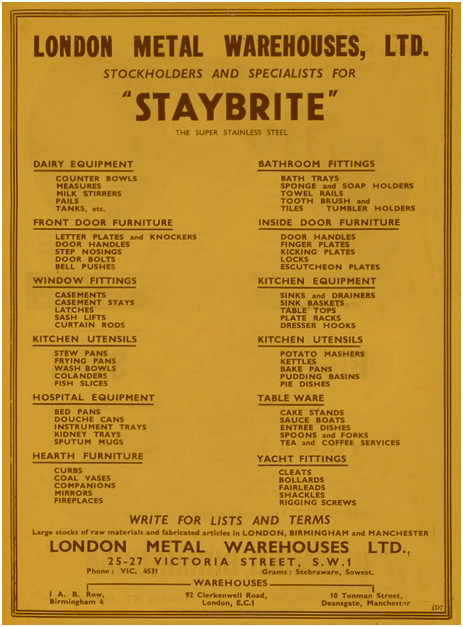 This advertisement, dating from the same period as the photograph, shows the wide range of applications for Staybrite stainless steel. 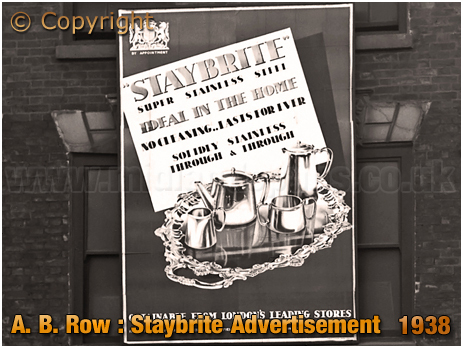 This was a good product to be distributing between the wars as demand for Staybrite cutlery soared. 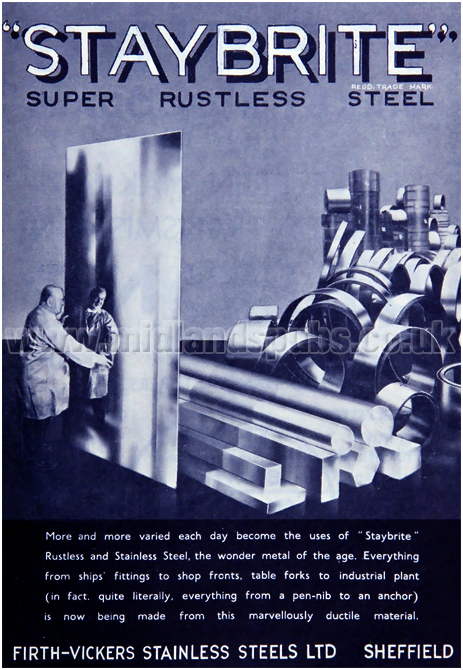 The man who had the vision of stainless steel in the domestic market was Harry Brearley. He 'accidentally' invented stainless steel in Sheffield shortly before the First World War. Indeed, it was the metallurgist's attempts to solve the problem of erosion in gun barrels that led him to the discovery of what he originally dubbed "rustless steel." He was subsequently awarded the Iron and Steel Institute's Bessemer Gold Medal in 1920. For distributing such a 'trending' product, London Metal Warehouses Ltd. acquired what were rather shabby and run-down premises in A. B. Row. It can be seen in the first photograph that many of the roof tiles were missing so the place was hardly waterproof. I presume that the office staff upstairs were issued with plenty of buckets for the rainy season. 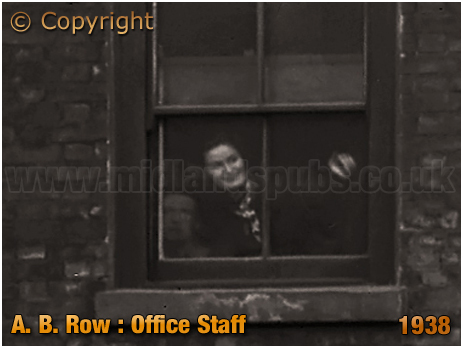 A few of the employees can be seen through the first-floor windows - I wonder what the woman was finding so amusing as she pointed across the street? As the business grew, London Metal Warehouses Ltd. moved into better premises in various locations around the country. From here on the edge of the old Aston and Birmingham boundary, they moved the short distance to Prospect Row and opened a showroom on Corporation Street. Continued growth in trade resulted in the firm moving to Moseley Street before opening a new warehouse at Earlswood in 1964. 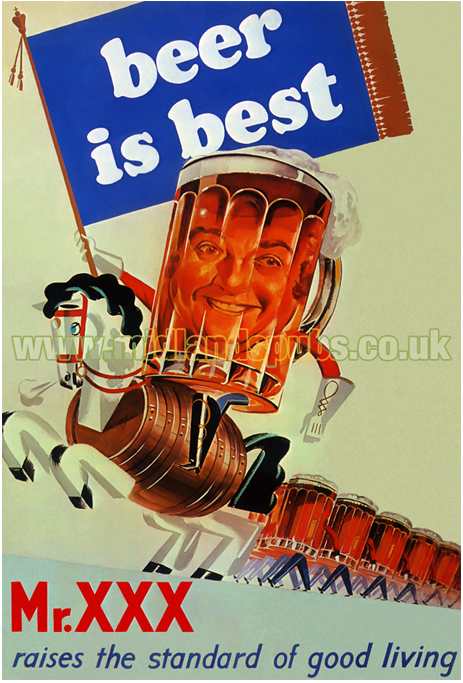 The manager of the new site was Mr. A. E. Ibbetson, a Yorkshireman who had been with the company since 1947. 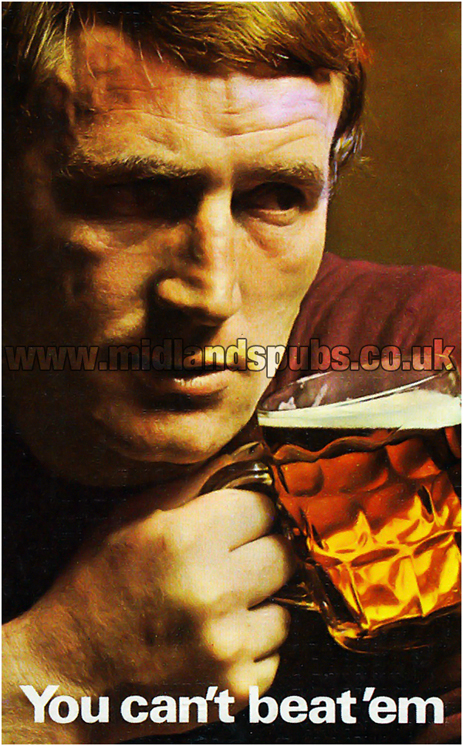 A native of Sheffield, he moved to the Birmingham area in 1946 and became well-known in Rugby Union circles as a playing member of the Birmingham club. He was also secretary of the club for some years. 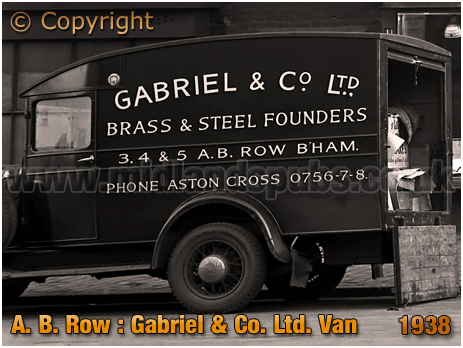 The van parked outside belonged to Gabriel & Co., another firm involved in the stainless steel trade in the 1930s but this represented diversification from the company's core business of brass-founding. Established around 1880, Gabriel & Co. had a small factory to the rear of Nos.4 & 5 A. B. Row where the workforce manufactured all manner of goods for the building trade, including lavatory fittings, water fittings and plumbing supplies. The company also made railway carriage, tramcar and motor car fittings, along with shipping brassfoundry. The business remained in A. B. Row for many years, a new larger factory occupying the site of A. B. House. The old date stone was incorporated into their premises but returned to the City of Birmingham when the firm relocated. Next to the original Gabriel's factory in the Victorian period was the A. B. Glass Works occupied by the glass bottle makers Jukes Brothers. This business was later based at 43 Aston Road. My interest in the building on the corner at No.1 A. B. Row is that it was seemingly a very short-lived beer house that has been short-listed [by me at least] as the boozer to have the shortest lifespan in Brum. In the census of 1861 the Birmingham-born publican John Fox lived here with his wife Mary. The couple had a young son, also named John. In this census the property was recorded as A. B. House. 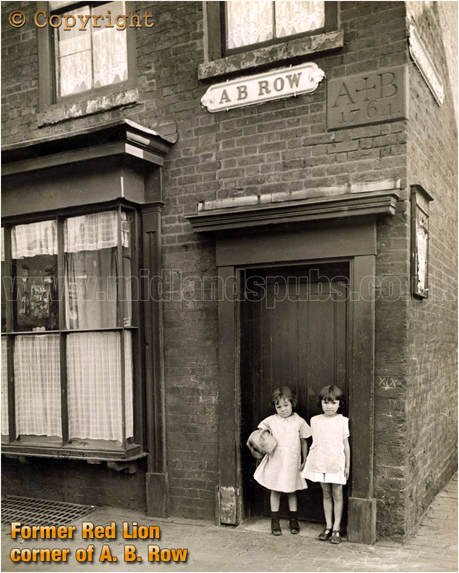 Of course, the fact that a publican and his wife lived on the premises does not prove that a public house existed here. They could have been running a neighbouring public house and simply lived here. However, that would be most unusual and generally a publican was expected to be in residence at the house for which they held a licence. In a manner similar to the inter-war photograph, the property had earlier been used as a metal warehouse and showroom. A brief spell as a public house does seem unlikely. 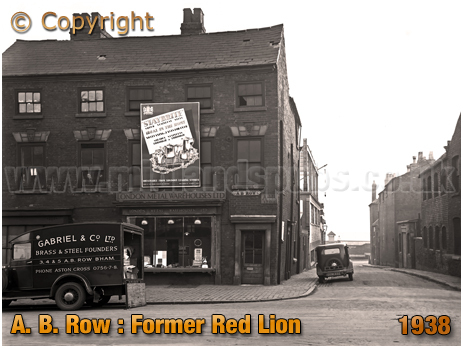 However, the above advertisement for the sale of the Red Lion does suggest it was located where Coleshill Street and A. B. Row meet and this is the location where these thoroughfares merged. There was another beer retailer at A. B. Row in earlier years. In White's 1845 Directory for Birmingham John Reynold was listed as a beer retailer at No.7 A. B. Row. He is recorded in Pigot's Directory of 1841 where he is listed as Reynolds. According to the directory there was little other commercial activity in A. B. Row at this time. Or at least of such significance to warrant being listed in the directory - or that those in business wished to pay for inclusion in the book. 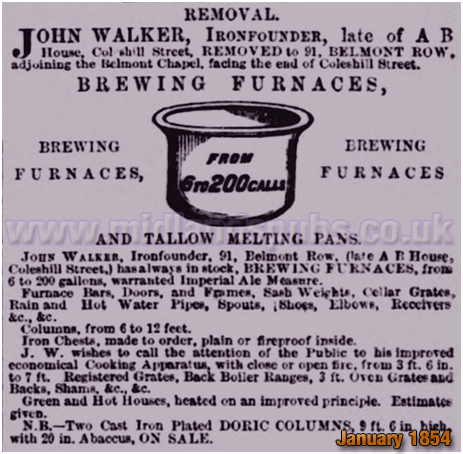 In Robson's directory published in 1839 only two businesses are recorded. William Allen, a statuary and mason, had been trading here for at least six years as he was recorded in A. B. Row in 1833. The other business was that of F. Page, a German Silver Manufacturer. The stone and marble yard was next to the beer house at No.7. The census of 1841 reveals however that other small scale businesses were operating in A. B. Row. For example, the jew's harp maker David Troman was busy a few doors away, a potter named Thomas Fox was operating a small business here and Mary Laver was turning out bonnets. The boundary between Aston and Birmingham is described as A. B. Post in the 1841 census where the enumerator made his way away from Curzon Street. Here at A. B. 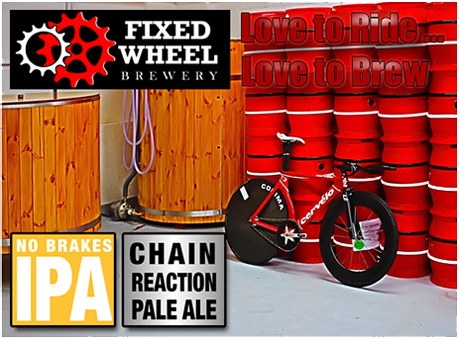 Row John Reynolds was recorded as a retail brewer so he and his wife Mary were operating a homebrew house. The couple had a young daughter called Lucy. The family later moved to Lawley Street from where John Reynolds worked as a porter, possibly at Curzon Street Railway Station. He certainly worked as a labourer on the railway in later years. I thought if would make sense to include a map at this point in order to clarify this section of A. B. Row with a view of how the whole triangle looked in the mid-19th century. No.1 A. B. Row, otherwise known as A. B. House, is in the bottom-left of this plan extract. The properties were numbered sequentially in an easterly direction. The large open space was soon to be filled in by the Cardigan Works of the engineer and millwright John Hands. This firm was formerly based in Prospect Row. The clerk is thought to have lived in the property fronting the hall which can be seen here in a photograph dated June 18th 1963. In addition to being a commercial bazaar, the Market Hall played more of a role in the local community. It also acted as a focal point for meetings. In August 1856 when Adderley Park was opened to the public, a procession started at the Market Hall in which local yeomanry and artisans marched with a band to the grounds where a dinner was provided for the mayor and other influential gentlemen. In 1862 it was reported the promoters of The Royal Concert Hall & Hippodrome Company Limited were to convert the Market Hall into "an ample first-class Concert Hall and Equestrian Theatre, capable of seating a sufficient number of persons to render the speculation amply remunerative" and to "attach commodious Supper and Refreshment Rooms to the Theatre." The company stated that : "The steady progress of education has given the masses a more refined taste, and fitted them for entertainments of a higher order, and wherever these appear, conducted with skill and energy, they cannot fail to ensure the promoters a satisfactory success; to meet this, the services have been secured of gentleman of long standing in the Metropolis, and who has acted as manager of several of the Theatres and principal public places of amusement." 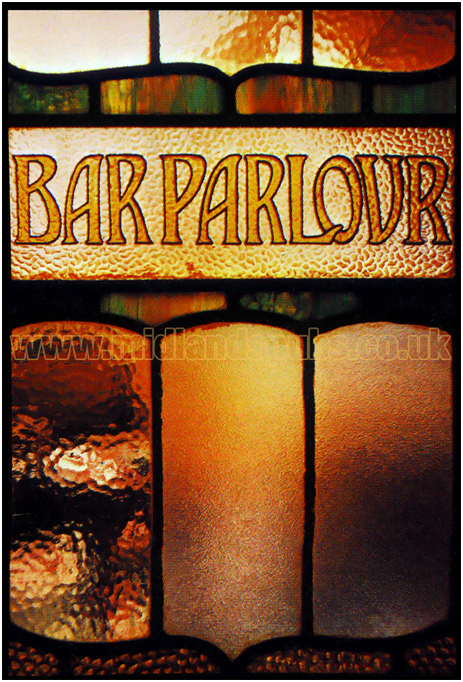 This was a period when early 'theatres' were being formulated, breaking away from the tradition of the pub concert hall. One such enterprise to open in 1867 was the Royal Concert Hall at St. Helena Gardens in Balsall Heath, a venture of Thomas Barns. 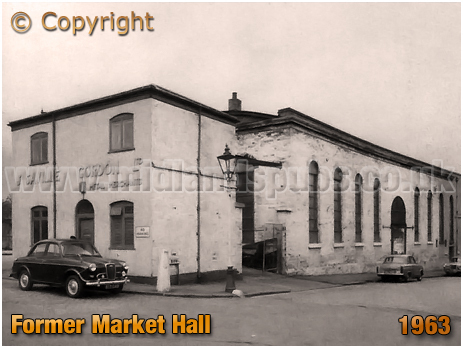 The market hall was eventually put to industrial use. The firm of Woolley, Nightingale and Pinnock were recorded at the Market Hall as iron dealers and merchants up until November 1882 when Samuel Woolley left the business. The other two men, William Halfon Nightingale and Thomas Pinnock, remained and traded as Nightingale, Pinnock and Co. In October 1913 worshippers at the Wesleyan Methodist Chapel celebrated the 125th anniversary of the building which they stated was opened by an elderly John Wesley in March 1789. The cleric and theologian, who dubbed the chapel the "East End House of God", recorded in his diary that "the morning was wet and the congregation small, but in the evening "heaps upon heaps were obliged to go away." The chapel originally accommodated between 600 and 700 worshippers "who sat upon benches, and, until a pulpit was transferred from Cherry Street Chapel, the preacher addressed them from a slightly elevated desk. Later, pews were introduced, and in 1832 a portico was added and the chapel enlarged." There was an adjoining minister's house and lecture hall which also served as a Sunday School. By the time of the plan above the building provided sittings for 1,085 people. The chapel ceased to be registered for public worship in 1932. The official closing took place on April 10th the reason for the cessation of services being stated as "the departure of large numbers of the congregation to the new suburban estates." 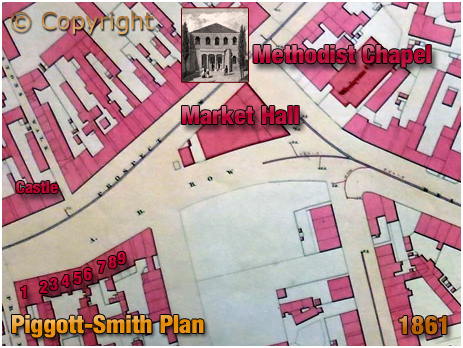 Any remaining congregation living nearby may have moved along the road to the Mission Chapel close to the junction of Lawley Street, though it was stated that most of the congregation would become attached to either the Central Hall or Lord Street Chapel. The old chapel was later used as a warehouse and before its demolition was rather ungracefully used by the Birmingham Waste Co. Ltd. Returning to the corner of A. B. House at the corner of Prince's Street, by the mid-1840s the property was occupied by Llewellyn & Ryland who were manufacturers in Britannia metal wares, spoons, brass nails, files and lacquers. This may be related to the business at Haden Street which is still trading in the 21st century. In 1845 a girls school was opened at No.4 A. B. Row by Miss Christiana Wood. Within the court to the rear, where Gabriel & Co. Ltd. would later operate, there were two small businesses - Henry Parkes was a cork screw manufacturer and William Vincent was manufacturing brass candlesticks. This notice provides excellent clues to the sort of activity that took place at A. B. House in the early 1850s. By the end of the decade John Fox is listed at No.1 as a beer retailer. In 1855 there is a John Fox listed as a victualler of the Heart in Hand in Lichfield Street but I have not established if this is the same individual. By the mid-1860s it was all change in A. B. Row, though there was some continuity as a school was being run by John W. G. Mase. Following his death, his wife Ann traded as a hosier and haberdasher. Next door at No.2 was the flour dealer Elizabeth Wall. This business was taken over by James Pettifer Pratt. He was recorded here in the 1871 census when A. B. House was being used as a bed manufactory by the Swiss-born upholsterer Alfred Renaud. 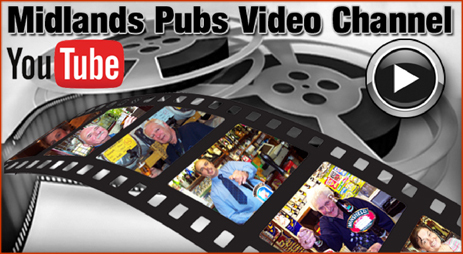 The beer house run by John Reynolds had long gone and No. 7 was occupied by the pawnbroker John Archer. 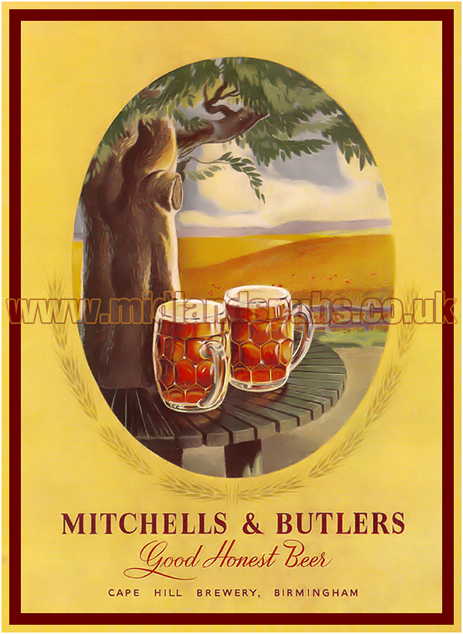 And so the businesses came and went through the years, though there is no further evidence of beer retailing. There were, of course, plenty of pubs in the locality, including the Turk's Head and Castle Inn across other side of the road. The buildings on A. B. Row continued to be used for a diverse range of commercial activities. The above plan of A. B. Row is an extract of an 1889 plan of the locality. 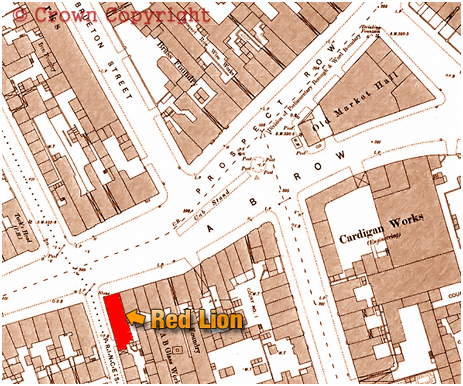 I have marked the location of the Red Lion, if indeed it was the Red Lion suggested in the advertisement of 1866. If you have a genealogy story or query regarding A. B. Row you can contact me and I will post it here in addition to including your message within the website pages for Birmingham Genealogy. 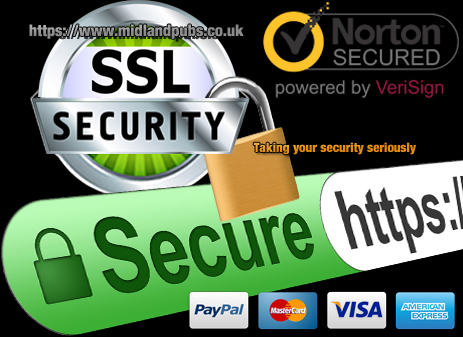 If you would like to share any further information on A. B. Row - whatever the reason it would be great to hear of your stories or gossip. Simply send a message and I will post it here. "Early on Saturday morning a tragic occurrence took place at 11, A. B. Row. The house is occupied by Mrs. Elizabeth Fisher, who let a furnished room to Philip Bass, a clerk, employed by Mr. Nossiter, New Canal Street, and his wife, Ann Bass. Bass and his wife had recently lived together on anything but good terms. On Friday afternoon they quarrelled, and Mrs. Bass went out of the house. According to the landlady's account Bass retired to bed at nine o'clock in the evening. His wife came home about ten o'clock the same evening, the worse for liquor. Shortly after four o'clock on Saturday morning Mrs. Bass went to the house of James Woodward, No.6 Woodcock Street, and telling him that her husband had committed suicide, asked him to come to the house. On their way back they met Police Constable Parry, and requested him to accompany them. On arriving at the house they found the deceased lying upon the floor with a terrific gash across his throat. A blood-stained razor was upon the table, and a bucket nearly half full of blood was standing near his head. Parry sent for Dr. Hadley of Prospect Row, who promptly attended. The deceased, however, was quite dead. Mrs. Bass stated that when she came home on the previous night she found her husband asleep in bed. She herself lay down to sleep upon a sofa in the same room. She awoke about four o'clock in the morning, and found her husband lying upon the floor with his throat cut, as previously described. A consultation took place between Dr. Hadley, Police Constable Parry, and Police Constable Marsh in consequence of which Mrs. Bass was removed in custody to Duke Street Station. When informed by the constable that she would be charged on suspicion of causing the death of her husband, she said, after being duly cautioned, "I am innocent." She was searched by Detective Bachirt, who also examined the room where the deceased was found. There were marks of blood on the floor of the room as if the blood had been trodden about, but there were no stains of blood upon the feet of the deceased, who was barefooted, being only attired, in a pair of trousers and shirt. There were no traces of blood upon the prisoner's boots, nor upon any of her clothes. The detective searched the house and water closet for any blood stained articles of clothing, but without success. The deceased was 51 years of age, the prisoner 50, and they had been married about fifteen years. They had no children. Information of the occurrence has been forwarded to the Coroner, who will perhaps hold an inquest today. At the Police Court, on Saturday, before Messrs. T. Avery, J. Jaffray, and W. Holliday, Mary Ann Bass , a married woman, 11, A. B. Row, able to read and write imperfectly, was charged on suspicion of causing the death of her husband, Philip Bass, by cutting his throat with a razor, on the morning of the 23rd inst. Police Constable Marsh asked for a remand till after the Coroner's inquest. When the deceased was found he was cold and stiff. The prisoner had been sleeping in the room all night. The prisoner was cautioned, and asked whether she had any reason to give why she should not be remanded. She appeared very much excited, and stated that about a week ago she had words with her husband, and she believed he had fallen out with his employer. He said he should do something to himself, but she thought it was merely a jest. Her husband went out to Aston, and returned about half-past seven in the evening, when he said, "See, I have brought the razor back," She said to him, "You don't mean to say you took that with you?" to which he replied, "I intended to kill myself at Aston Park." She was remanded till Monday, when the officer in charge of the case was informed that he must bring medical evidence to show that the wound upon the deceased's throat could not have been inflicted by himself." "Suspected Murder in A. B. Row"
"Yesterday, Dr. Birt Davies held an inquest upon the body of Philip Bass, aged 51, a clerk in the employ of Messrs. Nossiter and Co., of New Canal Street. On Saturday morning the deceased was found dead from a wound in the throat, and his wife was apprehended on suspicion of having murdered him. The following evidence was adduced : Elizabeth Fisher stated that the deceased and his wife had lodged at her house between seven and eight months. They occupied a room upstairs. She last saw the deceased at about six o'clock on Friday afternoon, the 22nd inst., when he passed from the yard into his own room. His wife came in afterwards, at about quarter-past seven o'clock and went to her husband. They quarrelled and she [witness] heard scuffling going on for about three-quarters of an hour. Soon after eight his wife went out, and she heard her say, as she was leaving the house, "I'll go and fetch a policeman," She returned at about half-past nine o'clock, and went upstairs without speaking to her [witness]. She was not sober when she left the house, and was much worse when she came back. In fact, she was quite intoxicated and staggered. She heard no disturbance during the night. She [witness] retired to bed at about a quarter to eleven o'clock. At about a quarter to four o'clock on the following morning she heard a rap at the door, and at once went downstairs and opened it. It had been locked from the outside. Ann Bass having a key; but the drop-latch was down. Upon opening the door, she saw Ann Bass, Mr. and Mrs. Woodward, with whom she [Ann Bass] formerly lodged in Woodcock Street, and two policemen, She was rather put about, and exclaimed "whatever is the matter?" to which Ann Bass replied, "Don't be alarmed, Mrs. Fisher; Bass has cut his throat," She then let them into the house, and they went upstairs. Since Easter deceased and his wife had not lived upon comfortable terms. They were frequently drinking; both of them were in the habit of getting drunk, Mrs. Bass especially. The deceased always conducted himself in a gentlemanly manner, even when drunk. She had known him beat her, and she [deceased's wife] was very aggravating at times, often called him bad names, and the result was that they often fought. The deceased was a tall, powerful man, and his wife would not have much chance with him in a "fair fight." She did not know whether he had a razor in the house. There was a water bucket generally in the room, but she did not know where it usually stood. The dress Mrs. Bass was then wearing was the one she had on Friday and Saturday. The Coroner to Mrs. Bass [who had a few minutes previously been brought into the room in the custody of a policeman]: "I understand you are in custody, is that so?" The prisoner: "Yes." The Coroner: "There must be some reason for that, but as you are here, I shall give you an opportunity of asking the witnesses any questions you may think fit, and of making any statement you, may desire; but before doing so I shall give you the usual caution. ; The prisoner said: "There are several questions I should like to ask. The witness is wrong in her statement about the time." In reply to the Coroner, the witness stated that she was quite sure it was between seven and eight o'clock when the prisoner left the house, and said she would fetch a policeman. The prisoner: "It was at about six o'clock when I went out." The witness: "It was later." The prisoner: "Then about the door - it was a policeman who opened it." Witness adhered to her former statement. Witness, upon being recalled, said she was quite sure that the deceased was a right-handed man. Sarah Woodward deposed that the deceased and his wife had lived with her for about six months. They were frequently quarrelling and were in the habit of getting intoxicated. Ann Bass called at her house on Friday morning. She was not intoxicated. She left, but called again about 8.30 in the evening. She then told her that her husband had been beating her. She advised her to go home and retire to bed without saying anything to him, and she soon after left. At about twenty minutes past four o'clock on Saturday morning she heard somebody rapping at the door, and upon looking out of the bedroom window she saw that it was the deceased's wife, who asked her to come down, as Mr. Bass had cut his throat. She then went down the stairs, and, having let her in, asked her what was the matter? and upon being told that Bass had cut his throat she said she couldn't believe it, to which the prisoner replied, "Oh, he has, he is quite dead and cold." At her request, she then gave her a glass of water. Acting upon her [witness's] husband's advice, she went, accompanied by Mrs. Bass, to fetch a policeman and a doctor. On their way they met two policemen, and told them what had occurred. Somebody else sent for Dr. Hadley who, with his son and his assistant, were soon after at the house. Upon going into the room with the policemen she found the deceased lying by the side of the dressing table - between the table and the right-hand side of the bed. He lay at full length, with his face downward. The distance between the dressing table and the bed would be about one yard. There was a quantity of blood near where he lay, and some in a bucket which was in the corner of the room, opposite the left-hand corner of the bed, and about two yards away from it. There were about two quarts of blood in the bucket. There was no track of blood between the place where he lay and the bucket. There was a smear of blood on the side of the bed. The prisoner, whilst they were in the room, took two life assurance tickets from a drawer, which she handed to her [witness], requesting her to take care of them. The Coroner: "Produce the tickets." The witness: "I can't. I haven't got them. They were taken from me, and I think Mr. Hadley has them." The Coroner: "Mr. Hadley has them?" Mr. Hadley: "Yes, sir, here they are." The Coroner: "You ought not to have them, I cannot suffer you to have them." Mr. Hadley: "I got them from the detective officer just before I came in." The tickets were then produced, and the witness said they were the same as she handed to her to take care of. They were tickets showing contributions paid on behalf of the deceased and his wife to the Royal Liver Society. The prisoner: "I should like to ask the witness if she ever heard the deceased say that he would destroy himself?" The Witness: :I never heard him say that he would destroy himself but I have heard him say that he would finish her when they have been quarrelling. I have heard him say that she would drive him mad." The Coroner, to the prisoner: "She says that she never heard him say that he would destroy himself." The Prisoner: "That's a mistake; she has heard him say so several times. [turning to witness]: Have you ever seen Mr. Bass with a razor?" Witness: "No, but I have seen him with a carving knife, which he has thrown at you. Police Constable Parry then produced the razor, which was covered with blood but the witness said she was unable to identify it. Sophia Woodward, daughter of the last-named witness said she remembered Mrs. Bass coming to their house on the Friday evening. She asked where her mother was, but upon being told that she was in the kitchen, said it did not matter about fetching her. Witness asked her how she was, to which she replied, "You can see how I am, look at my face, I have been obliged to rub it with some raw beef to keep me from having a black eye." She [witness] had remonstrated with Mrs. Bass about the continual quarrelling which was going on, and had often asked how it was they could not try and live peaceably together. Mrs. Bass in reply that she thought she should have to leave. Mrs Bass was drunk when she came to their house that night. She did not expect to hear that he was dead. She did not notice any blood upon her clothes at that time. The Prisoner [to witness] : "Did I not say that he was lying on the side of the bed on my side of the room near the washing stand?' Witness: "You might have said." The Prisoner: "Well, now, about the dying. When he asked me to fetch him some beer, because he said he was dying, I said, "Well, you'll have to die, for I've got no money," The Coroner: "Well you had better say that in making your general explanation." Police Constable Charles Parry said: He was called at 4.40 on Saturday morning, when in Duke Street to go with her to her house. Mr. Woodward and his wife and another constable were there at the time. Upon going upstairs, he found the deceased lying upon the floor and quite dead, cold, and stiff. There was a quantity of blood underneath him. He saw a bucket containing a quantity of blood in another corner of the room, which was from ten to twelve feet from the dead man's head. The bucket was about two yards from the foot of the bed. The razor [produced], was about three-parts shut, by the dressing table, and on the left side of the deceased as he lay. Between the bucket and the place where he lay there a were no droplets of blood whatever. "There were a few spots of blood on the inside of the bucket. The Coroner to Parry: "Did you take away the bucket?" Witness: Yes, sir, it's in a cell in Duke Street station." The Coroner: "What did you take it away for?" Witness: "I was told to do so by Police Constable, Marsh, who apprehended the prisoner, and who acted according to the directions of Superintendent Sullivan." The Coroner: "Do you not know that things on such occasions must be left in exactly the same position as they are found. Policemen put in possession are to take care, as they value their lives, not to allow anything to be removed, because it may prove the guilt or innocence of some persons, however slight the trace, which you cannot possibly judge of at the time. No human being is to be permitted to touch anything till he has communicated with the gentleman appointed by the Town Council, who represents me. We may have an innocent man hanged some day if people are to touch things when a death takes place. I am not blaming you particularly, for you seem to have acted under orders. I am merely reading a great public lesson. The Coroner then directed the officer to go and fetch the bucket in question, which he shortly afterwards returned with, and showed round to the Jury. The prisoner said she was not desirous of asking this witness any questions. Mr. Hadley said he was called to see the deceased at a few minutes past five o'clock on Saturday morning last. He found him quite dead and cold. He had since carefully inspected the body externally. There was a very extensive cut, extending from one side of the neck to the other. It was deepest on the left side of the neck, and appeared to end in two cuts. It passed through the jugular veins and the oesophagus severing the great blood vessels, but did not cut through the carotid arteries. The Coroner: "Can you say on which side the cut had been begun and ended?" Mr. Hadley: "No, I cannot." The Coroner: "Can you say whether there were any cuts on the deceased's hands?" Mr. Hadley: "I examined them carefully and there were not." The Coroner: "Is there anything on the person of the deceased to show that the wounds were inflicted by any other person than himself?" Mr. Hadley: "Certainly not." The Coroner: "Do you conceive any difficulty in supposing that he might have cut his throat over the bucket, and then got away to where he was found?" Mr. Harley: "I don't attach much importance to the position of the bucket." The Coroner: "Somebody seems to have thought a good deal about the bucket, or they would not have taken a woman into custody?" Mr. Hadley: "There are instances... " The Coroner: "Oh, stop. We are not going to have medical evidence of that kind. Would it be difficult for a man to cut his throat over a bucket, and then to get away to a place similar to that in which he was found?" Mr. Hadley: "I don't think it impossible. There are many such instances. The wounds in the neck were sufficient to cause death." Ann Bass was then called, and having been duly cautioned, she expressed a wish to make a statement, which she did as follows: "I wish to state that for the last fortnight the deceased has sworn to destroy his life, and on Saturday week he went out in the morning at ten o'clock, saying he was going to business. He returned at half-past seven in the evening and said "I've returned once more, and I've brought my razor back." I said, "Why did you take the razor?" He said: "When I went out this morning, I went with the intention of going to Aston Park, and there cut my throat, but I saw an article in the newspaper that made me alter my mind." I said, "I'm very glad. I hadn't missed your razor, or I should not have been able to do any work today." He said, "It will come to that, for my head is so very bad." On Wednesday he was very ill. He said he had the "blues" very bad. He was so ill I had to hold him down in bed all day from the drink. He went out on Thursday, and when he returned he took off his coat, hung it up, and said "I shall never put it on again." But, however, on Friday, he went out again. He returned at five o'clock in the evening, when he dined. We had a few words, and he struck me, but only once. We had no scuffling at all. I said "Philip, I will go to Duke Street Station, this time and fetch a policeman to you." When I got to the corner of Duke Street, Mrs. Wilson, who keeps the Turk's Head, I think, stood at the door. She said, "What's the matter with your face?" So I pulled my handkerchief away and showed her my face, which was bleeding badly. I said I told him [meaning my husband] that I would go to the police station and fetch a policeman; but I've altered my mind. I then went in at the invitation of Mrs. Jewkes. After I had waited some time, I said, "Well, he'll think I'm gone this time." I afterwards got up and went home. I found him lying on the sofa reading the newspaper. He said, "Mrs, will you fetch me a drop of beer, for I'm dying" That was the term he always used, when he wanted beer. I said, "You'll have to die, for I have no beer money." I made him a cup of tea afterwards, which he drank, and told me not to bother any more. I went out again for a short time. When I returned he was on his own side of the bed. His boots were off but not his socks. I looked at him to see if he was all right, and then I went and lay on the sofa, which is in the same room, all night, as customary when we had a quarrel. When I awoke in the morning it was twenty-minutes past four o'clock, and I saw his foot protruding from under the curtain of the bed. I said, "Philip, I wouldn't lie there; surely, the bed's large enough for you." There was no reply. His head was by the wash stand, and what appeared to be a lot of water by his mouth. I went a little nearer and saw that it was blood instead of water. I then went to Woodward's, and after that to the police station. That is all I wish to say." The Coroner then briefly summed up, and after carefully reviewing the evidence, and pointing out the arguments pros and cons, he remarked that to him there appeared to be nothing in the case to take it out of the ordinary category of suicides. With regard. to the statement of the prisoner, they would doubtless be inclined to look at it with some suspicion, It was a very rash step on her part to make a statement, in as much as, had she committed a single faux pas, she might have convicted herself of doing perhaps what she had not really done. There was not one feature in the evidence to show that she had interfered with the life of the deceased. There were several points in the case to which he might have averted - one of which was that she herself acquainted the policeman of the occurrence - and putting all things together, they made a very strong case substantiatory of her non-interference with the life of the deceased. Having distinctly pointed out what the Jury had to consider, he requested the public to retire. They were re-admitted in the course of fifteen or twenty minutes, when the Jury gave in a verdict to the effect that the deceased committed suicide whilst in a state of insanity. The prisoner appeared deeply concerned during the whole of the inquiry, and wept very much during the Coroner's summing up. The inquest lasted from half past four until five o'clock, and the approach to the inn where it was held was crowded with persons who manifested great anxiety to see the prisoner and to hear the verdict." "The Suspected Murder in A. B. Row"
"Two men who were charged with factory and office-breaking were said at Birmingham Stipendiary's court yesterday to have drunk two bottles of whisky at one place. Alan Pawley , of no fixed address, and George Barker , of Willis Street, Ashted, were sent for trial at Birmingham Sessions. They pleaded "not guilty." Barker was allowed bail but Pawley was kept in custody. They were charged jointly with breaking into the factory of Frederick Marsh and Co., Bromsgrove Street, and the office of Gabriel and Co., of A. B. Row, Ashted. Barker was further charged with breaking into the warehouse of the Danish Bacon Co., Walsall Road, Perry Barr. Mr. R. M. Dunstan, prosecuting, said that the men were found by the police on the night of Saturday 23rd July on the premises of Marsh and Co. Pawley was found lying in the yard and Barker was discovered in a hamper. The previous night, the premises of Gabriel and Co. had been entered and a safe opened. The intruders had drunk a couple of bottles of whisky. 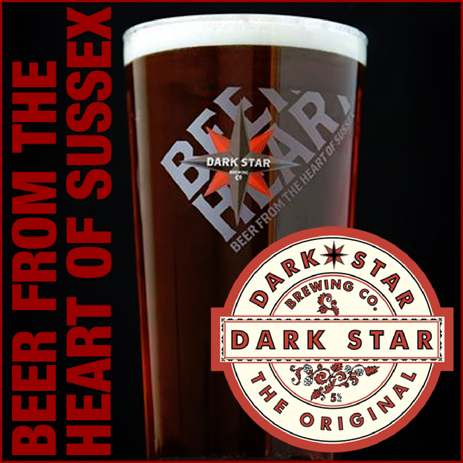 Fingerprints found on one of the bottles, said Mr. Dunstan, had been identified as Barker's." "A Story of Two Bottles Of Whisky"